I have shown the covers of both the original Edge of the Anvil (front) and the NEW Edge of the Anvil because they are the same and they are not the same. NEW Edge of the Anvil contains most of the original illustrations plus many new ones that are often more technically correct than the originals. It also contains more technical information of the type found in Machinery's Handbook (which many of you rightfully point out is my favorite reference). IF, you want to purchase one blacksmithing reference that starts at the beginning and takes you farther than any other single reference this is the book for you! Jack illustrates every tool and every process with his beautiful pencil sketches. 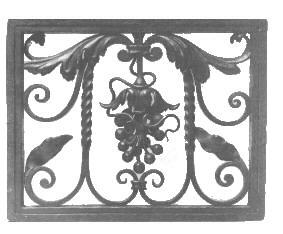 Keeping with the times however many of his old graphs and charts have been redone in CAD and there is a chapter on applying CAD to decorative metal design. 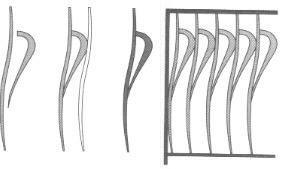 An intelligent artist, he knows to use hand drawing when it is best and the proper use of CAD for presenting technical data. The drawings show step by step many processes that are difficult or impossible to describe with words alone. 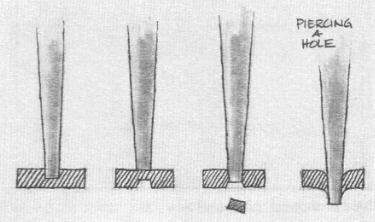 Typical illustration, "Steps in punching a hole"
Among the significant additions are the new portfolios of various artist blacksmiths such as Enrique Vega and an expanded section on the work of Samuel Yellin. The section on metalurgy for the blacksmith has been reorganized and more data added. Throughout the book there are numerous quotes from respected blacksmiths such as Samule Yellin and authors such as M.T. Richardson. 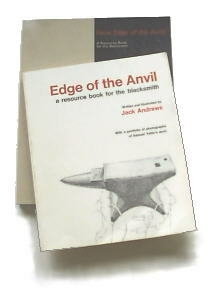 The original Edge was published in 1977 and the NEW Edge in 1994. Like the author the book has matured and kept abreast of the times.